"This story of intrigue, betrayal, and struggle for the Russian throne is the pearl in the crown of the Bolshoi Theater this season, and it’s somewhat like the Russian equivalent of Game of Thrones." Moscow is an excellent venue for devoted drama connoisseurs, even if you don’t speak Russian. Here are five foreign-friendly performances (with subtitles) to quench your theatrical thirst. 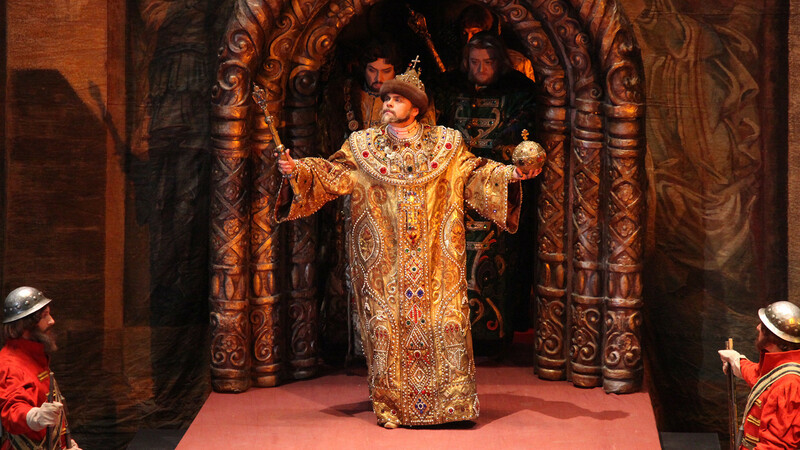 This story of intrigue, betrayal, and struggle for the Russian throne is the pearl in the crown of the Bolshoi Theater this season, and it’s somewhat like the Russian equivalent of Game of Thrones. Poet Alexander Pushkin popularized this true story of Tsar Boris Godunov and late 16th century Moscow court intrigue when he published his play in 1831. Almost 40 years later, however, Modest Mussorgsky transformed the play into an opera, which is now regularly performed on Moscow’s main stage. The two September performances are sold out, but tickets are available for the end of October, and range from 2,800 to 8,000 rubles ($50 - $140). English subtitles appear on a screen at both the Bolshoi’s historic and new stages. As a rule, all operas at the Bolshoi have English subtitles. Nikolai Gogol’s characters intertwine in this performance, based on the author’s famous book, Dead Souls, which is famous as a ferocious satire on social mores and structures in early 19th century Russia. The authors promise “a mix of buffoonery, the search for truth, eccentricity, satire and violations of commonly accepted rules.” The trailer, certainly looks grotesque, though promising. This surreal “search for truth” will cost you between 1,000 and 7,000 rubles ($17-$120). Upon request, non-Russian speakers are provided with tablets that support subtitles in various languages, including English. Almost all performances at the Pyotr Fomenko Workshop Theater are equipped with tablets, but they need to be booked at least one day before the show. For more details, go here. This modernist interpretation of Gogol’s literary classic is staged by Kirill Serebrennikov, the famous theater and movie director. Judging by the fact that most seats for the next performance on Sept. 26 are already sold out, it’s quite clear that the famous 19th century novel is still timely and relevant to people today. Fees for remaining tickets range from 1,500 to 3,000 rubles ($25 - $50). Note: this might be the only one of Serebrennikov’s performances available with English subtitles. The Moscow English Theatre (MET) is bragging that Lord Melvyn Bragg, a British broadcaster, has described its new production, “Educating Rita,” as a truly “magnificent” performance. This comedy about a young hairdresser and a not so young professor will be on stage at the Mayakovsky Theatre on Oct. 7 and 8. Founded in Moscow in 2013, the MET specializes in staging exclusively English language productions in the Russian capital and now calls the Mayakovsky venue its home. Tickets for the October show range from 1,200 to 1,900 rubles ($20 - $35), and for updates on premiers visit the MET’s website, or follow the theater on Facebook. This ‘life story’ of the theater’s two former actors is fictionalized and performed in three parts over three separate evenings, all directed by the famous Boris Yukhananov, who is also the theater’s artistic director. The core idea is to let the characters, Vladimir Korenev and Aleftina Konstantinova, talk about the war years, their childhood, as well as filmmaking, and their colleagues at the Stanislavsky Theater. The first evening opens on Sept. 16 and the other two follow on Sept. 17 and 18. Seats are still available, ranging from 1,000 to 5,000 ($17 - $90). For more details, visit the official webpage. The Stanislavsky Electrotheater regularly stages performances that accommodate foreign audience. The details, however, should be checked in advance.